Within the BIOMASUD PLUS Project there is an special chapter (WP3) dedicated to define the quality requirements of residential solid biofuels that will be integrated into the BIOMASUD certification scheme. Besides to the existing solid biofuels, the scheme will be extended to new solid biofuels produced in the Mediterranenan countries. Nowadays, there are no international (ISO) quality standards to grade important commercial Mediterranean solid biofuels like olive stones and dry fruit shells. Two Spanish national standards are available since 2014 to grade olive stones (UNE 164003:2014) and fruit shells (UNE 164004:2014) for residential use. However, the cited UNE standards were developed for biofuels produced in three countries (Spain, Portugal and France) and thus a revision is needed to verify their applicability to the solid biofuels produced on a wider Mediterranean area. In addition, UNE 164004 was developed for three types of fruit shells, namely almond, hazelnut and pine nut shells. Therefore, the scope of this standard should also be expanded to other fruit shells that are also available in the market: walnut and pistachio shells. 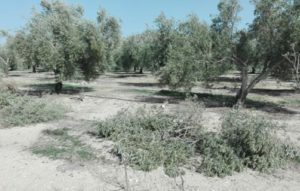 On the other hand, vineyard and olive tree prunings are being scarcely used as fuels today, but they represent a very significant, untapped biomass potential in the Mediterranean area of increasing interest for the market. At present, the only applicable international quality standards currently in place to prunings are ISO17225-2:2014 and ISO17225-4:2014 that grade wood pellets and wood chips, respectively. For that purpose, a total of 347 samples of vineyard and olive tree prunings, olive stones and fruit shells (almond, hazelnut, pine nut, pistachio, and walnut shells) from 7 Mediterranean countries (Croatia, Greece, Italy, Portugal, Slovenia, Spain and Turkey) were fully characterized for the relevant properties included in the corresponding relevant quality standards. The analyses were performed following common international standards for most properties and other relevant ones when ISO standards were not available, by laboratories from four countries: BIOS (Austria), CBE (Portugal), CERTH (Greece) and CIEMAT (Spain). The results are shown in the deliverable 3.2 . Before revising the existing limits in the current applicable standards, some samples were excluded from the statistical analysis because of not being representative for efficient/appropriate industrial processes for residential biofuel preparation, the use of additives and/or the presence of contaminations. The decision was made after a visual inspection of the samples, and after taking into consideration the information compiled during sampling and the results of their physical and chemical characterization. Finally, the specifications were performed and they are showed in the deliverable 3.3 and they should be taken into account as the quality classification limits in an updated and extended BIOMASUD label that will be adopted as a consequence of this Project, which will contribute to the relevance of the BIOMASUD scheme as a tool to promote the use of Mediterranean solid biofuels for residential heating applications. The specifications should also be taken into consideration to update the current Spanish standards that grade olive stones (UNE 164003:2014) and dry fruit shells (UNE 164004:2014) to accommodate solid biofuels coming from the geographical area covered in this project, which is more extensive than the one initially considered when these national standards were created (SUDOE EU Region).